In recent weeks China has directly become engaged, joining Russia and Iran, at the behest of the government of Syrian President Bashar al Assad, in the war against ISIS and other terrorist groups including Al Qaeda-Al Nusra Front and its numerous spinoffs. The formal agreement with Teheran, which has considerable on the ground experience with the fight in Syria, clearly represents a deepening of bilateral China-Iran relations. 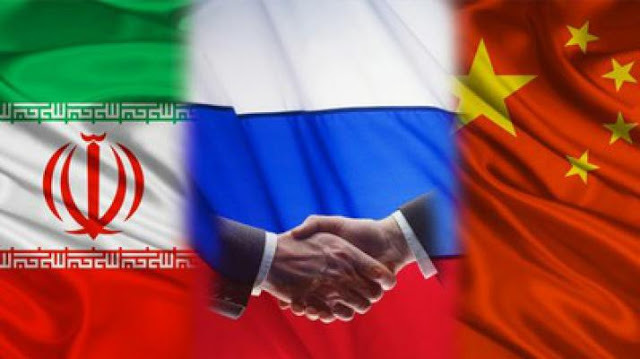 At the same time as China and Iran were meeting in Teheran, Viktor Ozerov, head of the Defense and Security Committee of the Russian Federation Council, the upper house of the Parliament, was also in Teheran. There, he told RAI Novosti that Russia and Iran are in talks over an arms deal worth around $10 billion. It calls for Russia to deliver T-90 tanks, artillery systems, planes and helicopters to Iran. In brief, we have a deepening of military defense links between the three points of the emerging Eurasian Triangle. This will have huge consequences, not merely for stabilization of Syria and Iraq in the Middle East. It will also give a major boost to the emerging economic links between the three great powers of the Eurasian Heartland. Halford J. Mackinder, the father of British geopolitics variously called Russia the Heartland Power, and towards the end of his life, in a 1943 guest article in Foreign Affairs, journal of the New York Council on Foreign Relations, suggested China might equally play the geographic and political role of Russia as the Eurasian Heartland Power. Today, given the enormous growth since 1943 of the geopolitical importance of the Persian Gulf oil and gas-producing nations for the world economy, the bonding together of Iran to China and to Russia forms a new Heartland Power, to stay with the designation of Mackinder. The added element since 2013 is the initiative of China President Xi Jinping to criss-cross all Eurasia and even South Asia with what he calls China’s One Belt, One Road infrastructure. Both China and Russia have formally agreed to coordinate with China in this multi-trillion dollar vast infrastructure project to link entire new emerging markets of Central Asia, Iran–and potentially Turkey– to a coherent high-speed rail and maritime port network that within the end of this decade will already begin to transform the economic worth of the entire Eurasia. Already despite onerous US and EU economic sanctions on Iran, Sino-Iranian trade had grown even before the 2015 nuclear agreement loosened some sanctions. Bilateral trade grew from $400 million in 1989 to almost $52 billion in 2014. Today the Iran-China Chamber of Commerce and Industries (I.C.C.C.I. ), has grown from 65 members in 2001 to 6,000, an indication of the intensity of economic cooperation. On the lifting of sanctions this January, 2016 China President Xi Jinping went to Teheran where the two countries signed major economic agreements. After their January 23 talks, Iranian president Rouhani announced that, “Iran and China have agreed to increase trade to $600 billion in the next 10 years,” adding that both countries, “have agreed on forming strategic relations, reflected in a 25-year comprehensive document.” Moreover, Iran agreed to nuclear energy cooperation and formally participating in China’s One Belt, One Road which Russia and the Eurasian Economic Union countries had formally agreed to join in 2015. China’s One Belt, One Bridge, sometimes referred to as her New Economic Silk Road, is a brilliant geopolitical, economic, military and cultural project. It will enable the member nations to be far more shielded from USA Naval power to interdict vital goods trade by sea from Europe or the Middle East that must pass through the US-patrolled Strait of Malacca. As well, while Washington and Brussels impose economic sanctions on Russian trade with Europe, the Ukrainian crisis forced a far more serious Russian “pivot to the East,” notably to China. What has emerged since the crisis created for Russia with the USA February 2014 Ukraine coup d’etat, is a strategic cooperation between the three major powers–Iran, China and Russia, what Zbigniew Brzezinski described in his 1997 book, The Grand Chessboard, as the largest geopolitical challenge facing continued Sole Superpower supremacy of the United States following Washington’s destruction of the Soviet Union in 1989-91. Iran is already partly linked to a recently-completed section of China’s OBOR rail-port infrastructure great project. In early 2015 rail freight began to move across the new Zhanaozen—Gyzylgaya—Bereket—Kyzyl Atrek—Gorgan railway, completed in December, 2014 in the impressive time of five years from start. That rail line links Iran to China via the rail line through Turkmenistan and Kazakhstan, a founding member of the OBOR idea since Xi Jinping first unveiled it in a visit to Kazakhstan in 2013. The new rail link, known as the North-South Transnational Rail Corridor connects Iran to Kazakhstan via Turkmenistan and on to the China border. The new rail line runs 908 kilometers, beginning at Uzen in Kazakhstan (120 km), then through Gyzylgaya-Bereket-Etrek in Turkmenistan (700 km) and ending at Gorgan in Iran (88 km). As a result of the new rail link, freight traffic is shifting from truck to rail as the line connects all key ports and terminals of the entire Caspian region. The new Iran-Turkmenistan-Kazakhstan to China rail line will transform the entire economic significance of the vast Central Asian region. Bereket in Turkmenistan — which is at the crossroads of the existing Trans-Caspian rail line linking Turkmenbashi on the Caspian Sea with Uzbekistan, Eastern Kazakhstan and China — is now to be site of a large locomotive repair depot together with a modern state-of-the-art freight terminal, making it a major freight hub. Further, the Turkmen government is building a huge port at Turkmenbashi that would enable further trade links potentially to the Russian Federation by sea. The rail link to Gorgan in Iran already is linked to Iran’s national railway grid and will thereby enable rail transport between China, Central Asia and the Persian Gulf. The connection will shorten the route by 400 km, and reduce freight transport time more or less in half, from 45-60 days at present to 25-30 days. This is a huge economic gain. Since April this year as well, Moscow and Teheran have been engaged in discussions of building a ship canal from the Caspian Sea to the Persian Gulf through Iran. Russia, Azerbaijan and Iran also agreed to speed up the talks on a North-South transport corridor that partly would go along the western coast of the Caspian Sea from Russia to Iran through Azerbaijan. The North-South corridor, when completed will reduce the time of cargo transport from India to Central Asia and Russia from at present about 40 days from Mumbai, India to Moscow to 14 days and bypass the congested and expensive Suez Canal.